Live Christmas Trees, Wreaths and Garland delivered to your front door. Buy real Christmas trees and have them shipped to your door. Wreaths, Garland, and Swags made from Pine and Fir. Live Christmas trees mailed directly to you will save you time. Free shipping included. We ship directly to your home at an affordable price - and free shipping on all orders! 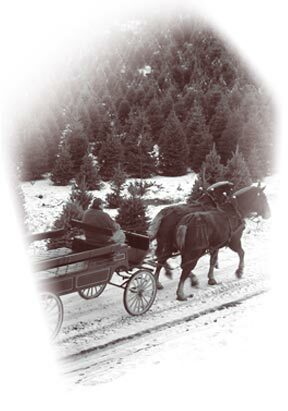 Give your family the best Christmas experience - Give them a fresh Christmas tree! Our fresh Christmas wreaths make great corporate Christmas gifts too! Make sure to follow us on your favorite social media platform for all the latest Christmas news and specials from Christmas farms. And, be sure to check this out for more great Premium Christmas Wreaths. It seems like every year the Christmas holiday sneaks up on us. We all get so busy that time just slips on by and before you know it, Christmas is here again. Well, last year when it happened, you vowed to be better prepared for the holidays this year didn't you? We all do. Take a look at the Christmas clock. That is all the time we have until Christmas is here. It is time to start considering answers to the tough holiday questions. How should I decorate for Christmas this year? Should I get a real tree? How many wreaths should I get? How much garland? Nothing symbolizes the tradition of Christmas on the exterior of your home more than the Christmas or Advent wreath. Wreaths are commonly made from evergreens as a symbol for the strength of life as these plants are able to overcome even the harshest of winters. Other components of wreaths can commonly be flowers; leaves; fruit; pine; holly, symbolizing immortality; and cedar, symbolizing strength and healing. In ancient Rome and Greece, people used decorative wreaths as a sign of victory and achievement. Greeks used wreaths as crowns of victory at the Pythian Games, a predecessor of today’s Olympic Games. In Rome, wreaths were usually worn by the women as a symbol of pride, and they were usually handmade from flowers, branches, twigs, thread, and laurels. They were also often worn on special occasions, such as weddings and the solstice celebrations. The origins of the Advent wreath are found in folk tales of pre-Christian Germanic people who, during the cold and dark winters of Eastern Europe, gathered wreaths of evergreen and lit fires as signs of hope for the coming spring and renewed light. Christians continued the popular tradition, and by the 16th century, Catholics and Protestants in Germany used these symbols to celebrate the Advent of hope in Christ. From Germany, the use of the Advent wreath spread rapidly to other areas of the Christian world. Traditionally, the Christmas wreath is commonly made of evergreen tree twigs, with pine cones, and a bow of red ribbon. Christian households and churches use a wreath of four candles in a circle of evergreens with a fifth candle in the middle. Each day at home, the candles are lit before the evening meal — one candle the first week, then another candle each succeeding week until Christmas Day. It is used to hang on a door as a symbol for the never-ending love of Christ. No home is ready for the holidays until the front door is decorated with a Christmas wreath. It’s a great way to show off your holiday cheer! Complete your holiday décor and online shopping with a fresh Christmas wreath from ChristmasFarms.com. Spread the holiday joy with a wreath in your home or in your office! Nothing makes a better gift for your friends, family, or coworkers than a beautiful, fragrant live Christmas wreath delivered right to their door. We carry a wide variety of types, including Douglas Fir, Balsam, Concolor, and holly berry wreaths. Purchase your wholesale Christmas wreath from our online store, and we guarantee delivery within the timeframe you specify.